The final Ford Hauler makes its way past downtown St. Paul on its way back to the yard on Dec. 16. Yesterday, Ford’s Twin Cities Assembly Plant closed for good when the last new Ranger truck rolled off the line. Whereas most of the interest in and coverage of this event took place at the front of the plant, I was more interested in the final events taking place at the back of the plant: the assembly and departure of the final Ford Hauler. Over the many years that I’ve been paying attention to Twin Cities railroading, train operations have started and stopped, changed routings, and changed owners, but there really is no comparing any of those to operations on the Ford line, having run virtually continuously in one form or other since the 1920s. How did the trains get to the Ford Plant? The Milwaukee Road built a branch off their St. Paul - Minneapolis “Short Line”, at a point appropriately named Fordson Junction, near the area in St. Paul where Western Ave. reaches the bluff line. To cross a deep ravine immediately west of the junction, a large timber trestle was constructed, a trestle which stands to this day. The Ford line more or less follows the direction of Seventh St./Fort Road, winding past the former Schmidt Brewery and through St. Paul’s West End, and as it nears Fort Snelling, it curves sharply west toward the river, and then north, paralleling Cleveland Avenue, and finally turning west again, under Cleveland Ave., terminating in a yard area directly behind the plant. At the time of the line’s completion, the Highland Park area was sparsely populated; eventually, the area around the railroad tracks filled in with new subdivisions, and the curvature of the railroad line influenced the alignment and curvature of the adjoining properties. Even though the Milwaukee Road ceased to exist more than 25 years ago, the line still sports some reminders of its heritage, including several examples of the distinctive Milwaukee switch stands, and at least one DOT grade crossing marker that says “MILW”. The Soo Line took over the Milwaukee in 1986, and the Soo’s parent, Canadian Pacific, took complete control of the Soo in 1991, and continues to operate the line today, but in all of that time, the Ford line’s operations underwent relatively few changes. I have a special fondness for the train operations around the Ford Yard, since for many years – all the years I was growing up, really – my grandmother lived in an apartment at 33 Inner Drive in Highland Village. Her back door was about 500 feet to the east of the Ford Plant, and I recall a fascination with sheer scale of it all: The super-sized parts cars with the names of exotic, far away railroads (at least to a young boy!) such as Norfolk and Western, Grand Trunk Western, and Chesapeake and Ohio, the flatcars stacked high with raw Ranger truck frames, the giant car-carrying auto racks, and of course, pairs of orange and black Milwaukee Road switch engines moving all of these cars back and forth. Sadly, though, as I became an adult, the regularity of the operation made it kind of boring – or put another way, when out looking at trains, I’d only chase after a Ford Hauler if there was absolutely nothing else going on. I figured that it would always be running, and so I’d focus my attention on operations that were changing, or were in danger of going away. I did start using the ’Hauler as a sort of informal economic yard stick: Every evening, I would check to see how many loaded auto racks were coming down from the plant. The longer the train, the better the economy. Of course, by the mid-2000s, Ford started making regular noises about closing the plant, and so I started putting the Ford Haulers at a higher priority. Back to this week. I spent the last few days of the week working out of my car (definitely a perk of working with a company that lacks formal office space), attempting to get some last photos of regular train operations on the Ford line. As the week had gone on, the trains had gotten shorter, and seemed to be running earlier than usual. No more parts were needed, and the last of the empty parts cars had been taken away. Especially at the Cleveland Ave. overpass, there were other people trying to document the last of these trains as well, which, in the case of one guy, did not escape the notice of a St. Paul policeman, who had apparently thought that someone standing on a public sidewalk aiming a camera at a car manufacturing plant that was imminently closing represented some kind of threat to all of our well-being. This fine public servant had actually pulled his patrol car perpendicular to the edge of the bridge, as if he were running down a fleeing suspect! 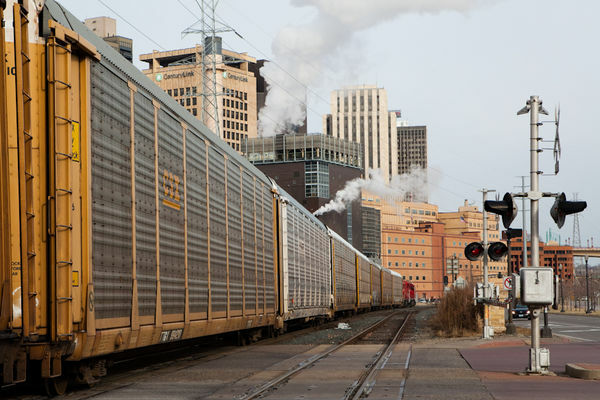 Yesterday, I got up early, at sunrise, just as the train was departing St. Paul Yard for the plant. In this case, there was nothing for the train to bring. There were plenty of empty auto racks already available at the plant to handle the last few Rangers that were being built, so only a couple of light engines made the trip up to the plant. When they arrived, a pair of Soo Line engines that were already at the yard did some switching, and then it became a matter of waiting for the last auto racks to be loaded. I went for some breakfast, and came back. After some more discussion, they departed for St. Paul Yard. I gave chase, but alas, due to a couple of bad driving decisions, I wasn’t able to get a shot of it on the iconic trestle, and I had to settle instead for a shot at Chestnut Street. I got a few more photos at Hoffman, and then I let them go as they pulled into the yard. Eighty-six years of operation, complete.